This is one of those comics that I could just sit and gush about. Everything about the Kate Kane Batwoman is fantastic, from her narrative construction to her incredible depiction by J.H. Williams III. Who, by the way, is on my very short list of artists that I actively will collect. Kate makes her way into the DCU by way of 52 and 52 Aftermath: The Crime Bible - her story in 52 is shepherded by Greg Rucka, who also tells her tale here. But here's why she's really, really important: she's an openly lesbian woman headlining one of the oldest superhero institutions in the world. Next to Action Comics, Detective's about as far back as superheroes go. So putting a queer woman in this title, without the euphemisms or typical tropes, is huge. Speaking of the typical tropes, Batwoman manages to avoid them. She's not the poster child for lesbians. In fact, the first instance of her non-heteronormative sexuality that we see is her being dumped by a woman for not taking the relationship seriously enough. This is a woman who has trouble keeping all her identities on track, be they superhero or girlfriend. It's one of the things I appreciate most about Kate, her difficulty in balancing her lives. There's an excellent article by George Gustines that was in the New York Times called "Out of the Closet and Up, Up and Away," about gay superhero parties at the Stonewall Inn. One of the interviewees talks about how the superhero really makes a great metaphor for closeted queer people. Kate isn't closeted, but Batwoman is definitely her most certain self, the one that knows what she's doing and how to do it. Sometimes it's not so much the masks we take off that reveal our true selves, but the ones we put on (ask any drag artist). This seems to be the case with Kate, and really with most of our superheroic myths. As the old saw goes, it's really only Superman that takes off his mask to reveal his true selves. Everyone else puts one on. I'll stop there for today. 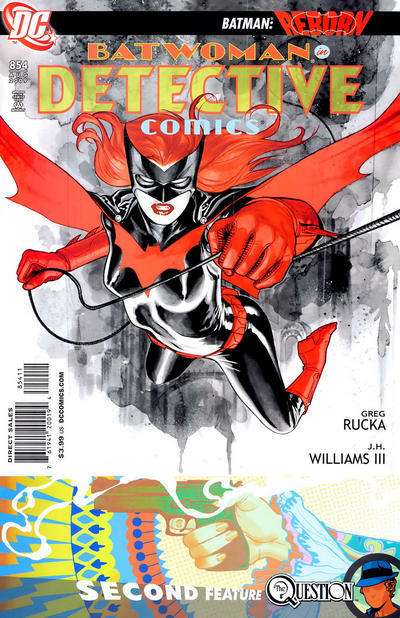 We're going to be spending a few days with Detective, so I'll gush about Batwoman some more tomorrow.